It’s official, “trust” is now the ad industry’s most important buzzword. Based on data obtained by RTBlog, “trust” has overtaken “viewability,” “transparency,” “fraud,” “ad blocking” and yes, even “data,” for the No. 1 position. The data I’m referencing is proprietary and the method used to process it cannot be disclosed, so you’ll just have to trust me on that. But since I have a blog to post about it, let me do what bloggers do when they make assertions they cannot back-up with empirical proof. They cite anecdotal evidence. Here’s mine. Okay, so I got more with the word “data” in them, but data is a much bigger subject, and is only truly buzzword newsworthy when it is compounded with the word “big.” Plus ranking it No. 1 would pretty much blow the whole metaphor I’m going for here. One of the biggest trust pitches I got included a lot of data. Come to think of it, it had some viewability, fraud and transparency in it too. It did not explicitly have any ad blocking in it, but I suspect that’s only because it was filtered out. The first thing I can say about the Trust Report is that evokes that theme in name and, I suppose spirit, but not in substance. At least not directly. I’m not sure exactly how I can measure that, so I will once again turn to word count data. The Trust Report does in fact cite its namesake 12 times, about half as much weight as is given to the thing the report actually focuses on “viewability,” which was referred to 21 times, including a nice “eye chart” (below), and I mean that literally. There is another chart that actually discusses trust. It delineates the degree of trust different sectors of the industry currently have. Oddly, this data is buried deep inside the Trust Report. 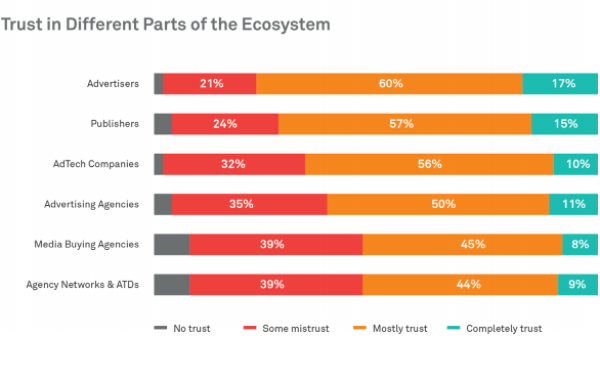 Even odder, it signals that the highest level of trust is among the stakeholders who matter most (advertisers), while the lowest levels are among the people who manage their media for them (agency’s and trading desk). I’m not 100% sure what that means, but I don’t think it’s necessarily that media buyers are a self-loathing lot. I think it’s because they feel trust is a bigger issue for them than for other stakeholders. How does the rest of the Trust Report word count data bear out? “Transparency” ranks just behind “trust,” and “fraud” came in dead last with only one mention. Now let me ask you, who's on first?